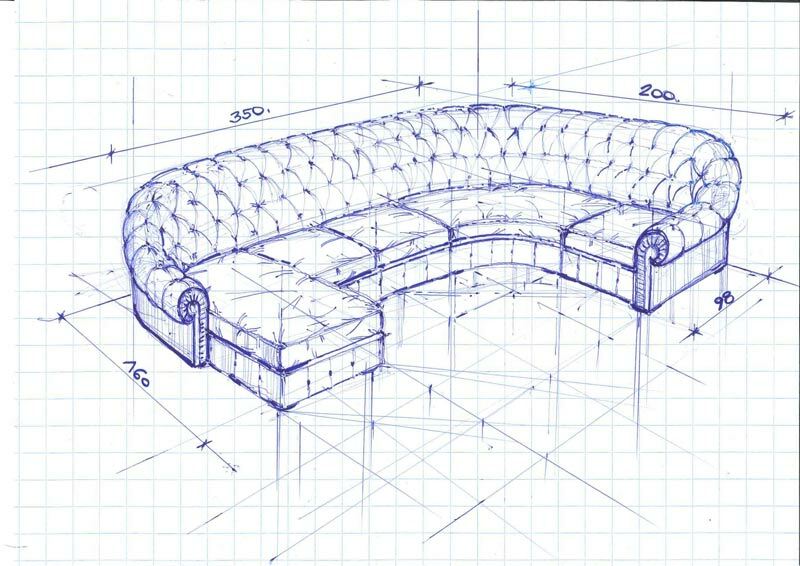 Chesterfield Sofas: plan your comfort. Chesterfield sofas are elegant, refined, authentic and even historic. They are surely the sofa par excellence for conversation. Its cushions filled with soft goose down is much like sitting on an elegant pillow in an epic 19th century living room. The first proposal sent by mail was an angular composition with square backs and arms, and made entirely with the classic quilted capitonnè of the Chesterfield. 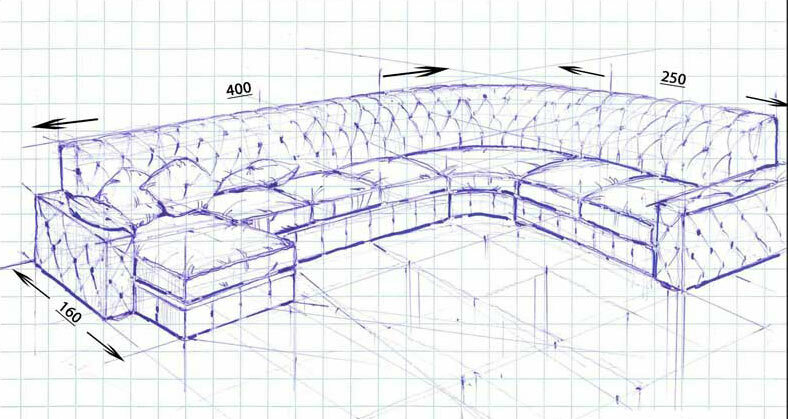 We began to consider however the possibility of a sofa-style more traditional, proposing to study and integrate the armrests. The customer accepted the proposal, so Carlo studied carefully the specifications of the client and then drew up the new design with new forms, dimensions and proportions. 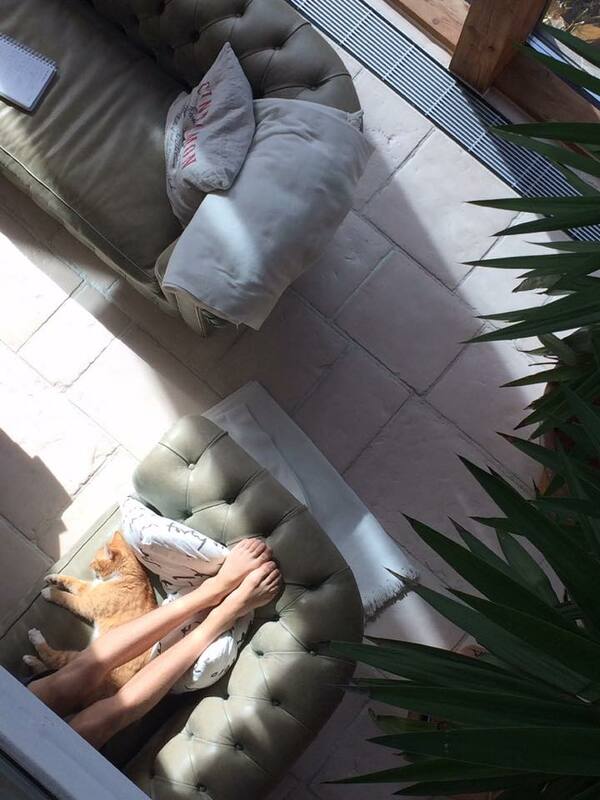 Ready to deliver a new proposal, which in fact was more technical than the first and with great particularity because the arm of the chaise longue connected to the back of the chesterfield sofa. The client appreciated the changes so much that he wanted more volume to the new proportions, establishing a definitive personalized style. Back in the showroom in Meda, while the phones were ringing and the mailboxes were full, we detailed a sampling of the different types and colors of leather that we recommended, traveling from Meda to Germany we established what the final cover would be. Does this story sound familiar? It is the story that Filippo Berto tells, in Berto projects. Anyone, anywhere in the world, can make unique exclusive furniture with Berto Projects. Thanks to Carlo Riva and our interior designer team, you can create a personalized Chesterfield composition: adding to, increasing proportions, making softer or denser the cushions, adding stylized feet, changing any detail is possible with Berto Projects. According to our client … you can. This is the photo he posted just a few days ago on our Facebook page. For more information, contact us at servizio.clienti@bertosalotti.it or call +39 0362-333082.